The policeman in charge of Parliament's security has said claims he "tricked" a Commons official into allowing a search were "grossly unfair". MPs are investigating how police were allowed to search MP Damian Green's Commons office without a warrant. Ex-Speaker Michael Martin claimed he was told Ch Spt Ed Bateman had "bamboozled" the Serjeant at Arms. But Mr Bateman said the Serjeant, Jill Pay, was a "formidable lady" who was in control of meetings with police. A cross-party committee of MPs is investigating the circumstances surrounding the arrest of shadow immigration spokesman Damian Green and the search of his Commons office in November 2008. MPs were furious police officers had entered the Commons without a warrant. The search was authorised by Ms Pay. In previous hearings the former Commons Speaker Lord Martin and the Commons' top official Malcolm Jack suggested she had been put under pressure by Mr Bateman. But Mr Bateman, who said his job had been to bring together Commons officials and the police investigating the leaks, said she had been "in charge of that meeting". "She is a formidable lady," he said. "She was very much in control. She was very forensic about the questions she asked us." Mr Bateman said police had not sought a warrant from a magistrates' court because they would ask why officers had not sought permission from the Commons first and Ms Pay was "very clear" about that. But he admitted he had not specifically told her she did not have to grant consent. 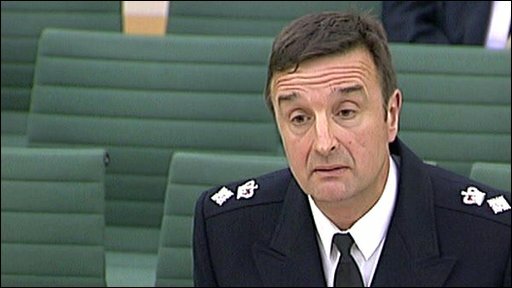 He told MPs: "However, because Jill Pay had understood the position that the MPS (Metropolitan Police Service) would approach a magistrate and apply for a search warrant in the absence of consent, my presumption was, knowing the alternative, she knew she did not have to consent to the search." The suggestions he had in some way "bamboozled" Ms Pay were "grossly unfair" he said, telling MPs: "Just following the evidence given to the committee, I have not heard why they think that. They have given no reason for them to think that." She was "emphatic" she would need to inform the Speaker there was to be a search. She called the Speaker just before Mr Green was arrested to alert him, he said, but the conversation lasted "less than one minute". In the short call, the Speaker had "asked no questions, but said that Damian Green was a nice man". Mr Green was arrested as part of a Home Office leaks inquiry and questioned for nine hours in November 2008. He was never charged and an inquiry into the police investigation ruled it was "not proportionate" - pointing out he need not have been arrested but simply invited for an interview. The Cabinet Office wrote to the police asking them to investigate the leaks and stating that "considerable damage" had already been done to national security. But an inquiry into the police probe found the leaks only amounted to "embarrassment" for the government. In Monday's hearing, the committee on issue of privilege was told that the Crown Prosecution Service had suggested there may instead have been an offence of misconduct in a public office. Deputy Assistant Commissioner John McDowall rejected suggestions that once it had become clear the documents leaked were not jeopardising national security, police and prosecutors were "scrambling" around for another charge. He said: "It was a discussion that clearly other offences may have been committed - I don't think I would describe it as a scramble to find other offences. That isn't the usual way in which we operate ... other offences were identified and then it was a matter of whether there would be evidence available for those or not." But he told the committee that the investigation could have been better handled and agreed it was "disproportionate". Ms Pay has been invited to give evidence to the committee on 7 December.